Ask Pip (FAQ) - Prestige Pet Products Pty. Ltd. I want to purchase something from your website but I am not a retail store? - How do I login or register an account with Prestige Pet Products? - How do I update or change my account information? - What do I do if I have not yet received my shipping confirmation? - Can I place an order over the phone? - I have completed my order but there are no payment options? - Can I change or add items to my order once I have checked out? - How much freight will I be charged? - I have spent over $700 plus GST and am eligible for Free Freight. Why is there an amount showing on the freight line? - Can I change the delivery address on my order? - Where do you ship to? - Can I send items to multiple addresses? - How long does it take my order to get delivered? - What if the store is closed and I can't accept delivery? - I have received my shipping confirmation but the delivery has not arrived. What do I do? - What should I do if I am experiencing a technical error? 1. I want to purchase something from your website but I am not a retail store? Please refer to our stockist page to find your closest store or even contact one of our online stockists!. If you print off the item you are looking for and take it into the store they may be able to include it in their next order for you. 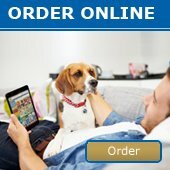 How do I login or register an account with Prestige Pet Products? If you are a business and wish to register for a stockist account, you will need to click the Log In or Register option in the top right corner of the page. This will direct you to an online form. Please fill in the required information and we will be able to forward our Trading Terms and Application to you. To update your account information you will need to send us an email. If you have not received your shipping confirmation after 24 hours, always check your email address under your account to ensure your email is current and spelled correctly. if it is correct and you're still not receiving your shipping confirmation, please contact us and we will assist you in tracking your order. Prestige Pet Products recommends orders being placed online, by email on sales@prestigepetproducts.com.au or by fax on (07) 5432 0201. This ensures there will be no mistakes from our side. However, if it is a little order then we are happy to take them on the phone. Prestige Pet Products only accepts payments from VISA, MASTERCARD, DIRECT DEPOSIT and PAYPAL. **Please Note - If you have a 30 Day Account with us and do not pay by credit card, direct deposit or paypal at time of checkout, your invoices can only be paid online by credit card. If you wish to pay by another method, please contact our office on 1800 265 527. I have completed my order but there are no payment terms? - Is this your first order? If you are a new customer and this is your first order, you will not have payment terms added to your account as yet. Because we need to make sure you are reaching the minimum first order spend, please send through your order as a REQUEST QUOTE for us to process in house. We will then contact you with the total for payment and have terms added to your login once the order has been sent to you. - Not your first order? Please contact our office on 07 5432 0200 or info@prestigepetproducts.com.au and we will assist you further. You CAN NOT make changes to your order once you have checked out. If you do wish to cancel your order please contact us within 24 hours and we can attempt to stop the order before it has been dispatched. How much freight will I be charged? Orders between $100 and $700 plus GST will be subject to our freight charges (Local - $15.00 + gst / Regular - $25.00 + gst). If you wish to place an order under our $200 minimum, this will incur a $20 plus GST surcharge and will need to be placed by phone, fax or email. Web ordering does not accept orders under the $200 + GST minimum. I have spent over $700 plus GST and am eligible for free freight. Why is there an amount showing on the freight line? The free freight over $700 plus GST only includes our normal freight charge. All orders, regardless of total, will be charged the Packaging and Handling fee (to cover our warehouse picking and packing costs). If you live within a postcode deemed as remote by our transport company, you will still be charged their on-forwarding fee regardless of order total. This is a total set by the transport company themselves and we are unable to override this. Some items in our range may be deemed as bulky and as a result, will incur an extra freight fee. You will be contacted by our team if your order is going to incur such a fee before we send it out to you. Can I collect my online purchase from Prestige Pet Products? Yes, collecting your order is an option as well as delivery. Please call the office on 07 5432 0200 or email info@prestigepetproducts.com.au to organise this once you have placed your order. You cannot make changes to your order once you have checked out. If you have made an error or have not updated your delivery information, please contact us and we will attempt to stop the order before it is dispatched and change the incorrect information. If you notice your address/contact information is incorrect BEFORE you complete your order - Please SAVE YOUR CART and contact our head office on 07 5432 0200 to update your information before you place your order. We ship all over Australia. We do not ship internationally. Prestige Pet Products uses Direct Freight Services to ship orders and therefore you must supply a street address as PO boxes are unable to be delivered to. Only one delivery address per store will be accepted. Delivery should be expected from 2-7 days depending on the location. Brisbane CBD, 2 working days, QLD and NSW, 2-3 working days, VIC, SA and TAS, 5-7 working days and WA and NT is 5-7 working days. During high volume times (Such as Christmas), please allow an extra 1-2 days. What if the store is closed and I can't accept the delivery? The driver will leave a card advising the receiver that a delivery was attempted. The receiver is then to make contact with our office to arrange another mutually convenient delivery date. Goods may be left but only if we are in receipt of written instructions from the sender or receiver. These instructions can be included in the consignment note in the "Special Instructions" panel. E.g. If not home leave behind side gate. I have received my shipping confirmation but the delivery has not arrived. What do I do? Your order will take between 2-7 working days to get to you. This time frame does depend on the dispatch day and the destination address. If your delivery has taken longer than 7 working days please contact us and we will track your delivery for you. Shortages or other discrepancies must be notified immediately upon receipt of goods. No Claim will be recognised after 24 hours of Proof of Delivery. Please contact us at info@prestigepetproducts.com.au with the relevant invoice number and date of supply. If any item is faulty or broken, please provide photos of any damage, if applicable, and a written explaination on the fault/breakage. ***PLEASE NOTE*** Our products are measured from one tip to the other (unless otherwise stated, e.g collars). All measurements on our website are approximate.